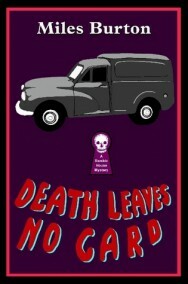 A door is broken down, a dead body is found behind it; there is no other exit from the room, but equally no sign of a weapon nor any evidence of suicide…these classic staples of the archetypal impossible murder are put on page one of Miles Burton’s Death Leaves No Card. Added to this is the puzzle of precisely how the deceased came to decease, as there is sign of neither violence nor harm on the body, no evidence of poison or gassing, and, this being the early 1940s, the house is not yet fitted with electricity so it can’t have been electrocution. It may or may not be a locked room, since the window might or might not have been open, but the unclear nature of the death definitely makes it an impossible crime in my eyes. Either way, cue sensible Inspector Henry Arnold. And then it struck me: this is the first classical impossible crime I’ve read that isn’t solved with the assistance of a genius amateur; it is in fact almost purely a police procedural, like something from Freeman Wills Crofts, with the steady accrual of evidence and timetables and permutations on interpretations furthering the investigation. Someone called Desmond Merrion, who I get the impression would normal fill the Genius Amateur rôle, is mentioned but dismissed in the next line as he has ‘flu and that’s as much of a look in as he gets, thanks very much for coming. I can’t compare the relationship from other books, obviously, but while it doesn’t exactly feel as if something is missing it’s fair to say that there is something of a charisma vacuum at the heart of this, which isn’t helped by the fact that Arnold himself is frankly a bit of an arse. Now, obviously, the point is that policemen should be governed only by evidence and not flights of fancy, but at this stage said subordinate’s thinking has already progressed the case a giant leap, and the suggestion he puts forth next explains away another confounding part of the case. Had it been Superintendent Hadley from The Hollow Man two weeks ago or Chief-Inspector Beale from Policeman’s Evidence last week complaining about policemen thinking, it would have been half in jest at themself. Arnold just seems closed-minded and ungrateful. Elsewhere he’s scornful of a female character for being able to confirm that a something she saw for a moment once is the same something she’s being shown several days later (sorry, but I’m trying to give nothing away), dismissing her lack of instant certainty as ‘womanish’, so at least he’s equal opportunities arseholish. That these are pretty much the only expressions of his personality in the entire book doesn’t help, either, as they stand out as his sole emotional reactions. The rest of the time he’s simply portrayed in action, not thought. Possibly he’s a riot elsewhere – standing up for the suffragettes, encouraging schoolboys in their playful pranks, hosting a Wassailing singalong – but not here. Anyhoo. The different perspective this type of investigation brought to this type of crime was something I really enjoyed. I’m not convinced about the key clue that tips Arnold to the workings of the murder – I just don’t see how the [REDACTED] would be in the [REDACTED] – but there is a huge amount to enjoy before it comes to that, and the essential idea is very cleverly set up. There’s one thing I felt sure was a clue, so casually was it referred to on a couple of occasions, that turned out to be nothing, and this has more than enough of that type of potential to keep the armchair sleuth interested. Not ground-breaking, not epoch-defining, but very well written and worth your time if you go in for this kind of thing. A quick note, too, on the cover of this Ramble House edition by the superb Gavin L. O’Keefe. It is an extremely pleasing example of taking a simple picture and turning it into a simple piece of art, reminding me of the cover for Pink Floyd’s Atom Heart Mother. It in no way reflects upon the book, of course, but of all O’Keefe’s exceptionally diverse imaginings for RH this is probably my favourite, its essential dullness part of what makes it so charming. Good work, sir. Great review, I’ve always wanted to read a detective story by Miles Burton, though from what you’ve said I’m not sure I’ll start with this one. The crime itself sounds intriguing but I’m not so sure about the main detective or the police procedural focus, as I’ve never been much of a fan of Crofts’ Inspector French. Ah, John Rhodes… I have ‘Claverton Affair’ and ‘Venner Crime’ somewhere on the shelf. To date, I’ve only read one novel by Freeman Wills Crofts – ‘Hog’s Back Mystery’ – which I found to be enjoyable. Just wondering what you mean by ‘police procedural’, and if that is meant to be a contrast against the puzzle-oriented plots of Golden Age mystery? I have Hog’s Back, will be getting to in in the not-too-distant future and am interested to see how it compares to the likes of The Cask, etc. My take on a police procedural is something wherein there is a clear and linear progression of an investigation, so the footprint at the crime scene leads to a specialist boot-maker leads to the buyer of said boots leads to the charity shop he donated them to leads to the credit card details of the person who bought them leads to the discovery that the owner of the credit card has been dead for 15 years…etc, etc. A puzzle plot is more a sense of interlocking ideas and actions that come together to form a conclusive picture only at the end, and a lot is up for grab before then – Christie’s Evil Under the Sun is always the classic example that jumps to mind for some reason. Hmmm. I suppose there isn’t always a clear distinction between the genres. I’ve always regarded, say, Christianna Brand’s ‘Green for Danger’ and ‘Death of Jezebel’, or even some of the Poirot novels, to be puzzle-oriented mysteries, but the plot in these cases unfold like a police procedural. Yeah, it’s a tricky one. Green for Danger isn’t really either in my eyes, it falls too much in both camps (though I’d say it’s more procedural than puzzle), and The Crooked Wreath was much the same, although slightly more puzzle-based. It’s not that easy to delineate, really, and I mentioned in this review just because the procedural nature struck me so strongly. Hmmm, will give this some thought and see if I can provide any further clarity. I’ve read half a dozen of the John Rhode Dr Priestley mysteries, including THE CLAVERTON AFFAIR and THE VENNER CRIME. I’ve thoroughly enjoyed all of them. THE VENNER CRIME and THE MOTOR RALLY MYSTERY are particular favourites, and PINEHURST (aka DR PRIESTLEY INVESTIGATES) was great fun. One word of caution – almost all of his books were published with different British and US titles so you have to be careful not to end up buying the same book twice! I’d rate John Rhode as one of my favourite golden age writers. Good to know about the titles, many thanks! I’ll definitely read A Small of Smoke at some point, after which it becomes quite difficult to tack him doen as he’s mostly OOP I believe. Will make a decision based on ASoS and go from there. Still not read a Miles Burton (or a John Rhode) – ever! I know, very bad of me … I do wish the Ramble House editions were a bit cheaper but I really applause the risk they take in resuscitating such obscurities. Glad this one is a good ‘un! I know what you mean, with the realtive cheapness of ebooks these POD publishers can seem a bit pricey…especially galling when you try something and it doesn’t work out. But if it’s the only way to guarantee reading something I’m curious about it’s a hit I’ll have to take. I’ll just follow the example of certain businesses and make the money back by refusing to pay my taxes. As many as 13 books by Miles Burton featuring Merrion and Arnold (though not this book) are available for free downloading at Internet Archive. Glad to see you’ve enjoyed your first Burton. I just picked up my first one this weekend at a community Book Fair–The Hardway Diamonds Mystery. I’m looking forward to giving him a try. Certainly on this evidence he’s worth consideration; will be interested to see what others make of him, though, as I can se why he wouldn’t be to everyone’s taste (but then, I suppose, who is? ).